It can happen that while you are creating an event on your computer, this one is correctly synchronized with your smartphone few minutes later. However, the contrary doesn’t work: you are trying to create an event on your smartphone, but this one never appears on your computer … frustrating!! This is due to the fact that when you are creating this event on your phone (or your tablet), it’s not created on the right calendar. Indeed, by default, most of manufacturers (Samsung, HTC, Sony, …) add their own calendar on smartphones and are enabling this agenda as the default agenda. 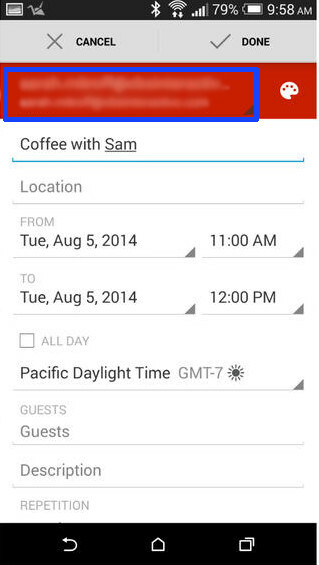 This calendar is only existing in local on your phone and won’t be synchronized with your Google account. When you are creating an event, you have to check that it’s added to your Google Agenda (linked to your account) and not to this local calendar. This choice can be performed through the combo list available at the top of the event creation page (see screenshot below, the blue box). If you’re not doing this step, the event will so be inserted in the internal agenda (manufacturer calendar), and won’t be synchronized with your Google account.